A carbon monoxide detector is a small appliance that warns people about the presence of carbon monoxide, a deadly gas. Any home that has fueled appliances, such as a gas stove or hot water heater, an oil-burning furnace, or a wood-burning stove, is at risk of becoming filled with carbon monoxide. Because the gas has no scent or color, it’s important to have a carbon monoxide detector in the home. Unless all of your appliances are run with electricity or batteries, you need a carbon monoxide detector to keep yourself, your family, and your pets safe. We’ve evaluated many carbon monoxide detectors to find the most effective models available. We’ve considered price, ease of portability, the warning sounds made, how long the detectors last, and how they are rated by users. We’ve narrowed it down to a list of the top 5 carbon monoxide detectors. We’ve also included information on the other 20 that we looked at so you can make the right decision for your family. A carbon monoxide detector that’s reasonably priced and has a battery backup for safety. The First Alert CO605 was the clear pick for the top spot in our list of the top 25 carbon monoxide detectors. It’s reasonably priced and has the most sensitive detection technology available, a loud alarm, battery backup, and is very easy to install. This is a smart choice for anyone who needs to keep their home and family safe from the danger of carbon monoxide. 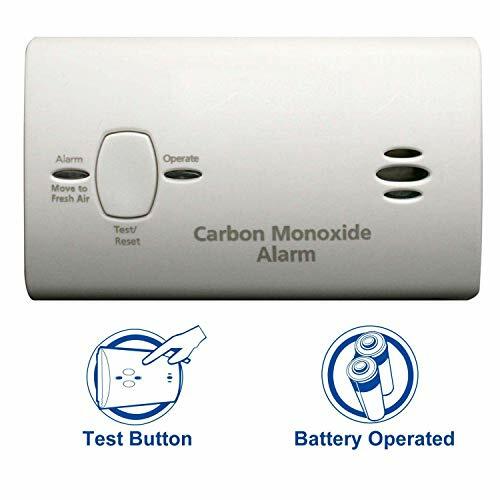 The First Alert CO605 Carbon Monoxide Plug-In Alarm with Battery Backup uses an electrochemical sensor, which is the most sensitive type of carbon monoxide detection method available. If the gas is detected, it will emit an 85-decibel alarm to wake you up and alert you to get out of the building. The detector plugs into a regular household outlet, but it also has a battery backup and uses two AA batteries (included). This is important because you might be more likely to have a problem with carbon monoxide if the electricity goes out and you’re using a generator or having to grill your food just outside the home. There is also a low-battery indicator that will make a sound to tell you when to change the batteries. Testing is simple with the First Alert CO605: Just press a button on the unit. There are no complicated displays or settings to change, so this one is great for people who want a basic alarm that they can just plug in and not worry about other than pressing the test button each month to make sure it’s working. Enjoy peace of mind with a digital display. 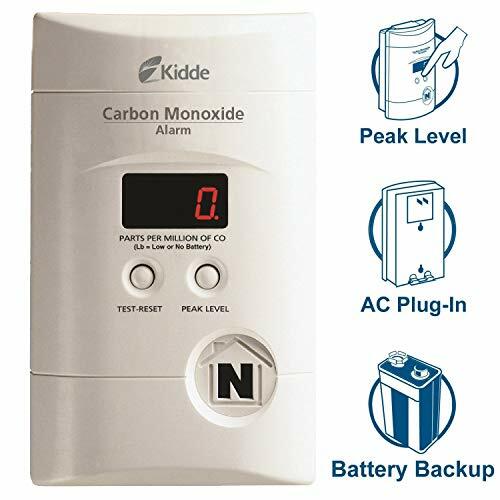 The Kidde KN-COPP-3 Nighthawk Plug-In Carbon Monoxide Alarm with Battery Backup came in very close to the top spot when evaluating carbon monoxide detectors. One of the best functions is that a digital display will tell you exactly how much of the deadly gas has been detected, as well as the peak CO level detected since the unit was last reset. This can be helpful to first responders, particularly if anyone in the home has been made ill by the exposure. The alarm plugs into a regular outlet and also has 9-volt battery backup in case of a power outage. If abnormally high levels of carbon monoxide are detected, the alarm gives off four loud beeps, followed by five seconds of silence. This will repeat until it’s reset or until the gas levels decrease to under 30 ppm. There’s no need to worry about whether the alarm is actively working, either: A light flashes intermittently, letting you know that the batteries are still good and that the unit is monitoring the air. Finally, the Kidde KN-COPP-3 Nighthawk can be mounted one of three ways and comes with a 6-foot power cord to allow for tabletop mounting. Economical and reliable protection for your family. The Kidde KN-COB-B-LPM Carbon Monoxide Detector won the designation of top budget pick. For those on a tight budget, this alarm will keep them safe without stretching the finances. The unit has a simple, uncomplicated system: If carbon monoxide is detected, a red light will flash and a loud alarm will go off, alerting those in the house to leave the home and call for help. A green LED light flashes every 30 seconds to let you know that the unit is working and monitoring the air. The alarm is battery-operated: It does not plug into an outlet, which makes it very easy to place the alarm virtually anywhere in the home. It also eliminates the possibility of a power outage affecting the accuracy of the alarm. Three AA batteries are included. As an added safety feature, it’s impossible to close the battery compartment if the batteries are not installed fully and correctly. Plug it in and you’re ready to go. The First Alert CO600 Plug-in Carbon Monoxide Alarm was our top pick for plug-in detectors. If you want to plug in your monitor and not worry about it anymore, this is the alarm for you. It fits into any standard outlet without mounting; you literally just open the package and plug it in, and your family is protected from this potentially deadly gas. With a sensitive electrochemical sensor and a loud, 85-decibel alarm, you can rest assured that you will be notified of any abnormally high CO readings. There is a test/silence button, which makes it easy to test it each month and also to silence the alarm if it does go off. The alarm is meant to last seven years and comes with a 7-year warranty. Protect your family from smoke and carbon monoxide. The First Alert SCO5CN Combination Smoke and Carbon Monoxide Alarm detects and warns you about not only carbon monoxide but also smoke. Its sensitive dual sensors will stay on alert day and night to keep your family safe. This is a battery-operated unit, so you don’t have to worry about plugging it in or what to do in the event of a power outage. Two AA batteries are all that you need for peace of mind. One unique feature of the First Alert SCO5CN is the varying frequency of the alarm. An 85-decibel alarm will wake even the soundest sleepers, and its lower frequency notes might be more likely to wake those with mild hearing loss. The photoelectric smoke sensor minimizes false alarms from shower steam or cooking smoke and the electrochemical carbon monoxide detector is among the most sensitive available. The alarms for smoke and carbon monoxide detection are different, so you will know what sensor has been triggered. Almost everyone should purchase a carbon monoxide detector for their home. Carbon monoxide is emitted by fuel-burning appliances. It can also be emitted from running cars, gas grills, and generators that might be used when the electricity goes out. Because the gas is colorless, odorless, and otherwise undetectable, a carbon monoxide detector is necessary to keep you and your family safe. Even if you don’t have any fuel-burning appliances (i.e. your stove, dryer, and heating sources are all electric), a carbon monoxide detector is essential if you have an attached garage. If you cook outdoors with a gas or charcoal-burning grill, dangerous carbon monoxide can leach in through open windows and doors. Finally, if you own a gas-powered generator for backup in case your electricity goes out, the carbon monoxide emitted can go in through a window or a door. A carbon monoxide detector will alert you to the presence of the deadly gas inside of your home. Aside from using a CO detector in your home, you might also consider taking one with you on road trips or when camping. You could also bring one with you when you visit family members or friends and stay overnight in their homes. These detectors are small and portable enough that they can be used anywhere, and the battery-operated style don’t need electricity to work, making them perfect for a camping trip or to keep in an RV. Ease of use. If your carbon monoxide detector is difficult to install or you have a hard time getting the battery compartment opened or closed, it’s less likely that you’ll get it installed or change the batteries as needed. A complicated display with a lot of buttons can also be difficult to figure out. This is, of course, counterproductive to your desire to keep your family safe. Look for a detector that is easy to install and use. Volume of alarm sound. Most carbon monoxide detectors emit an 85-decibel alarm sound, which is loud enough for most people. If, however, you are hard of hearing or you have a hearing impairment, you might need one that’s louder or that emits a lower frequency sound. Availability of backup power. Some carbon monoxide detectors run only on battery power and others run only on electricity. Still others run on both so as to have a backup power source. While battery-powered CO detectors will give you a chirping sound to let you know it’s time to change the batteries, those that plug in and don’t have battery backup can’t give you any type of notification that the power is out. Detectors that plug in should ideally have a battery backup in case the electricity goes, since that is the time when you might be most at risk for having carbon monoxide build up in your home (due to generator use). What do you do if your carbon monoxide alarm is beeping? First, determine what the beeping is. If it’s a chirp that repeats every minute or two, it is likely the low-battery indicator. Change the batteries to stop the beeping and to maintain protection. If the alarm is going off, it means that carbon monoxide has been detected. Gather up your family and pets, if possible, and leave the building immediately before calling 911. If you cannot remove your pets, open all of the windows before taking your family outdoors. If you have a gas or oil-burning appliance running on a main floor, shut it off if you can do so very quickly. Do not go into the basement, because CO is a heavy gas and the levels might be even higher in the lowest level of the home. Do not re-enter the home until a professional says it’s safe to do so. Also, do not try to take items with you; carbon monoxide does not present a threat to your belongings. Where should you place a carbon monoxide detector? A carbon monoxide detector should be placed near each sleeping area of your home. If all of your bedrooms are upstairs, you can place on in the common hallway. If you have a split-plan home with one bedroom on one side and guest bedrooms on the other side or if you have some bedrooms upstairs and some downstairs, you will need at least two carbon monoxide detectors. Because carbon monoxide sinks and because many people have fuel-burning appliances like a dryer, a hot water heater, or a furnace on the lowest level of the home, it’s a good idea to also place a detector in the basement or on the ground floor. Follow the directions that come with your unit to find out where you should install the detector. Most are plugged into an outlet a foot or two above the floor. Others, particularly those that are combination smoke and carbon monoxide detectors, are meant to be installed near the ceiling. Can a smoke detector detect carbon monoxide? A standard smoke detector will not detect carbon monoxide. The only kind of smoke detector that will detect CO is one that specifically says that it’s a combination alarm. Read the specifications of your smoke detector to find out if it’s also a CO detector. If it isn’t, buy a separate CO alarm. Carbon monoxide detectors have a lifespan and an expiration date stamped on them. Most will last five or seven years. Check the date on your detector and make a note to replace it by the date on the unit. We looked at 20 other carbon monoxide detectors. Even though they didn’t make our 5 best carbon monoxide detectors list, they’re the best of the rest and each is still a great option for your home. The information you’ll need to compare each one is included with the listing. With a large, easy-to-read digital display and excellent protection during power outages, this carbon monoxide detector will keep your family safe with no stress on your end. It comes with three AAA batteries for immediate installation and use. Peak level indicator displays the highest CO concentration since the last reset. 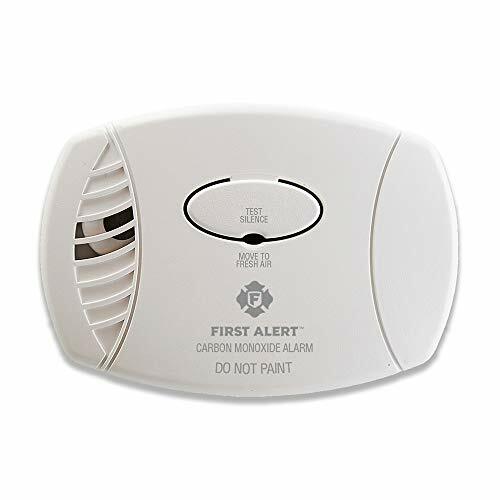 If you’re looking for a simple, budget-friendly carbon monoxide alarm with a sensitive sensor and uncomplicated directions, you can’t go wrong with the First Alert CO400. This convenient carbon monoxide alarm is truly no work for you. Open the package, slide the alarm into the included bracket, and it will keep your family safe for 10 years. Never replace a battery! This battery-operated carbon monoxide is reasonably priced and offers both an 85-decibel alarm and a visual notification when CO levels are dangerously high. 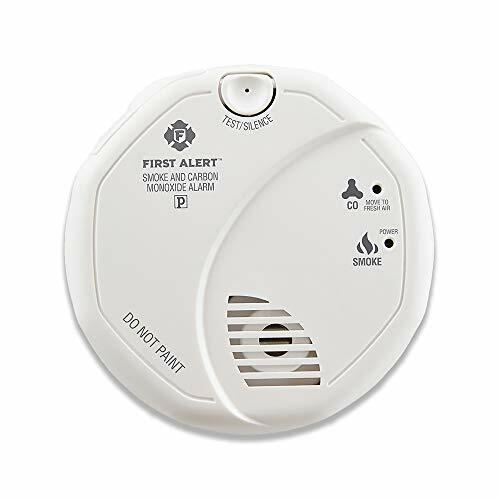 The First Alert BRK CO250 comes with a 9V battery and uses the most current electrochemical technology available to alert you immediately of any unsafe carbon monoxide readings. This First Alert carbon monoxide detector has a digital display that features a peak reading since the last reset. There’s also an easy-access battery door and it takes 2 AA batteries (included). The Sunnec carbon monoxide detector makes it easy to know when there has been dangerous carbon monoxide exposure: A voice warning is added to the loud alarm, and a digital display shows you the peak reading. If you’re looking for a simple, easy-to-use carbon monoxide detector that has no complicated display but features a sensitive monitoring system, you can’t go wrong with this one by Coowoo. This economical carbon monoxide detector features a digital display and an easy-to-use test/reset button. Just put in the batteries and you’ll be protected right away! This plug-in carbon monoxide detector is simple to use: Just plug it in (choose a bottom outlet if you still want to use the top one) and it’s ready to go. Test/silence buttons and a low-battery indicator help you feel secure that the unit is doing its job. This Kidde alarm is simple to use: Just plug it in and it’s ready to start protecting your family. A test/reset button ensures that the alarm is working, and there are no complicated displays to worry about. The First Alert CO615 includes a battery backup and a digital display for the utmost in safety and security for your family. This carbon monoxide includes a smoke detector. The unit is hard-wired, so if one detector in the house goes off, they will all go off for extra safety. This combination alarm will warn you in words (either “fire” or “warning, carbon monoxide”) what the danger is so you know to get your family to safety. 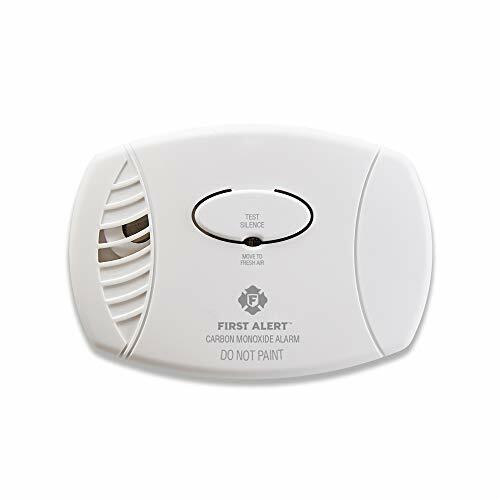 The First Alert combination smoke and carbon monoxide detector can be hardwired and connected to other First Alert or compatible alarms for whole-house protection. There’s no guessing involved with the First Alert SCO7CN, because it tells you exactly what the threat is and where the smoke or carbon monoxide has been detected. This slim carbon monoxide and smoke detector has been designed to fit in with your decor. Its twist-off installation makes it easy to change batteries. This smoke and carbon monoxide alarm provides excellent protection against both threats with the most sensitive types of sensors available. The Kidde P301K-CO includes a 10-year sealed battery, which will keep this combination smoke and CO alarm working for up to a decade. This 10-year alarm will keep you safe from smoke and carbon monoxide for a decade without any battery changes. Sensitive technology for both CO and smoke detection.